If you're pregnant, you probably know all too well that some of the symptoms are...well, not fun. Luckily, there are easy, effective ways to deal with them. Not every pregnancy is the same, but chances are you'll face at least one or two of the most common symptoms while you're carrying your children. Whether it's nausea, back pain or trouble sleeping, pregnancy comes with its fair share of, shall we say, unpleasant side effects. They key to getting through it in one piece? It's all about understanding how best to deal with each issue. We spoke with OB/GYN Diana Ramos, M.D., co-chair of the National Preconception Health and Health Care Initiative, to hear a bit about what natural, safe, simple at-home remedies pregnant women can use to relieve their symptoms. 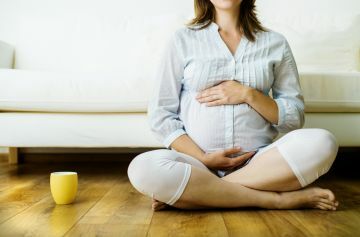 It's arguably the most common side effect pregnant women face—and that might be in part because too many pregnant women fail to prevent nausea. According to Dr. Ramos, diet plays a huge role in warding off this symptom—so if you'd rather avoid it altogether (as opposed to dealing with said queasiness after the fact) try this little tip: "The most important thing to do with nausea is just to have small, frequent meals. I want to emphasize bland [foods] because a lot of times women are not aware that spicy foods will trigger the nausea," she says. "Another thing they can try is ginger tea—but everything in moderation." Dr. Ramos suggests that SeaBand nausea relief wristbands may help. "[These] get put on the wrist, on the pressure point for nausea," she explains. While plenty of pregnant women scoff at the term "morning sickness" (it can definitely feel a lot more like "all day sickness" for some), if you're suffering from true morning sickness—that is to say, you feel fine most of the time, but find yourself vomiting first thing in the morning, here's a smart strategy to try: "My recommendation is to have something in your stomach before you even get out of bed," Dr. Ramos says. You can certainly stash a packet of crackers on your nightstand and reach for them as soon as your alarm rings—but you want to keep an eye on this symptom. "If [morning sickness] gets too bad, seek help because it could be dehydration," Dr. Ramos says. Again, dehydration could be playing a role in causing those awful pounding headaches you might experience. "Making sure women are well hydrated and eating foods that are high in water—like lemons and watermelon—that will help," she says. Dr. Ramos advises drinking at least eight glasses of water a day—but more is certainly better in this case. "Another [possible cause of headaches] is anemia," Dr. Ramos adds. "If it persists, women should make sure they're not anemic." For women who tend to get migraines, prevention is key, especially if you want to lay off the prescription-strength painkiller you normally take during your pregnancy. "The biggest thing is to avoid the trigger," Dr. Ramos says. "A lot of times women know what those triggers are—sometimes it's diet, foods that they eat. Many times it's lack of sleep that can trigger a migraine." Acupuncture may help with migraines as well, according to Dr. Ramos. The bad news? Back pain sort of comes with the territory when you have a baby bump. The good news? You can take steps to counteract this effect. "Oftentimes it's a result of their posture," Dr. Ramos explains. It can be definitely be tough to resist the urge to hunch over when you have that unfamiliar weight distribution to contend with, but there are steps you can take to make it easier to stand up straight. "There are multiple support belts for the belly, and they can help," Dr. Ramos says. "Often doing stretching exercises [or prenatal yoga] can help, as well as standing up and walking periodically so you're not sitting all the time." Heated pads can help relieve back pain—but soaking in a hot tub is a no-no. "The very high temperature can affect the baby's brain," Dr. Ramos warns. You think the flu is unpleasant? Try suffering through it during pregnancy. "Often pregnant women are so exhausted that they forget to hydrate with tea and water and soups," Dr. Ramos says. "When [pregnant women] do get sick, tea, more liquids [and] steam help with congestion." Her best suggestion? Get immunized. Obviously, fatigue can be tied to lack of sleep, so the best way to deal with this is to get enough shut eye (easier said than done, we know). If you're abnormally tired even after a full night's rest though, an undetected health issue may be to blame. "If they have underlying anemia, the fatigue would be more pronounced. If fatigue is excessive and they really can't get out of bed, they should be evaluated for anemia," Dr. Ramos advises. If you're struggling to break up with your four-cups-of-coffee-a-day habit, peppermint tea is a great alternative, according to Dr. Ramos. Between the fears you hold on to during pregnancy, the struggle to adjust to your new shape and the frequent middle-of-the-night bathroom runs, getting enough sleep can be tough for pregnant ladies. Dr. Ramos recommends walking and getting some exercise in early in the day to help with prenatal insomnia. One thing she doesn't recommend? Melatonin, as the effects haven't been studied on pregnant women. It can be tough, but putting your cell phone down well before you get into bed can help. Dr. Ramos suggests a nighttime ritual that includes "some chamomile tea, avoiding caffeine, trying to relax before bedtime [and] avoiding any screen time [or] TV." "As the baby gets bigger they may not even be sleeping in bed, they may try sleeping in a recliner," she says. "They have all sorts of pregnancy pillows to support the belly that can help. Really it's [about] trying to figure out what works best for them. I wish I could tell you there's one solution that works for everyone."